Leach, Robert A.; Key, Thomas D. S.; Vitelli, Mario A. 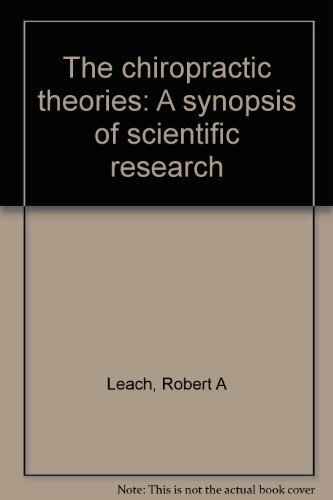 This comprehensive and up-to-date reference of chiropractic theories supplies the methodology protocol and terminology used in chiropractic research. It includes topics, such as vertebral subluxation complex; facilitation; and segmental dysfunction and reviews research on chiropractic manipulation of controversial areas such as essential hypertension; bowel and bladder dysfunction; dysmenorrhea; and asthma. The book also provides understanding of chiropractic science and keys to its development. Regardless of whether one is treating conditions with chiropractic care or administering adjustments to improve overall health of the patient, it is important for students to know the strength and limitation of knowledge for treatment of patients with these diverse conditions. This edition includes new chapters on segmental dysfunction hypothesis; soft/hard outcome measures of dysfunction; facilitation hypothesis; developing chiropractic scientist/practitioners. It also has a new focus on clinical applications aimed at the practitioner. Each of the chapters has been revised and six chapters and two appendices added, as well as new information on technology. This text includes background information on chiropractic philosophy theory and history, critical for understanding what professionals must do to benefit from chiropractic science. It acts as the basis reference for entrance exams, National Board of Chiropractic Examiners - Part II test of Chiropractic principles.